I lived in Georgia for a few years, back in the mid-90’s. Transferred for work, we packed up all our things and made the long drive down to start what I call, the Southern era of my life. Very different from life in the north, life in Georgia lacked good pizza, the Chinese food was terrible and bagels were a mere shadow of the ones we were used to. Maybe things have changed since then. Yes, I actually do analyze the many ups and downs in my life by the food that I’ve experienced. Dysfunctional? Maybe. But I like to think that the mental diary of meals I keep, stored next to the 80’s song lyrics in my brain, will one day be worth something. I have many fond food memories from down south. I can recall dinner at this hole-in-the-wall joint known for the best fried chicken and catfish in Georgia. I swore there was a creek that ran through the back of the restaurant, with some guy catching the catfish, only to have them hit the deep-fry seconds after being caught. This was the real deal, and so good. In Georgia, I ate my first hush puppy, had my first bowl of Brunswick Stew, enjoyed a real buttered biscuit with the grease proudly dripping down my sleeves and fell in love with BBQ. I have never tried smoking meats and my BBQ abilities are limited to my backyard Weber grill. I can’t put a finger on what inspired me to make this pulled pork, but it’s always been one of my favorites (see My Infatuation with the Pig). After a little research, I came up with this recipe. No smoker required. It took under 3 hours and we ate it Mexican style, in warm corn tortillas. For my next trick, I will make this again with Southern BBQ flavors. For now, I consider this a successful mission accomplished. Perfect for a crowd, this makes a lot of pulled pork. I’ll guess it makes tacos for 8, possibly more. Mix the oregano, chili powder, chipotle powder, cumin, salt and pepper in a small bowl. Season the pork all over with the rub. Heat a large dutch oven over medium-high heat and add a little canola oil to the bottom of the pan. Add the pork pieces, working in batches and brown on all sides. Remove from the pan and set aside. Saute the onion till translucent, add the garlic and stir for one minute until fragrant. Add the chicken stock, tomato sauce, beer, chipotle pepper, adobo sauce, honey, bay leaves, orange and lime juice, scrapping up any brown bits in the bottom of the pan. Stir in the tomato paste. Bring to a hard simmer and add the pork back to the pan. Spoon the sauce over all the meat. Cover the pot and place in the preheated oven for 2 hours. 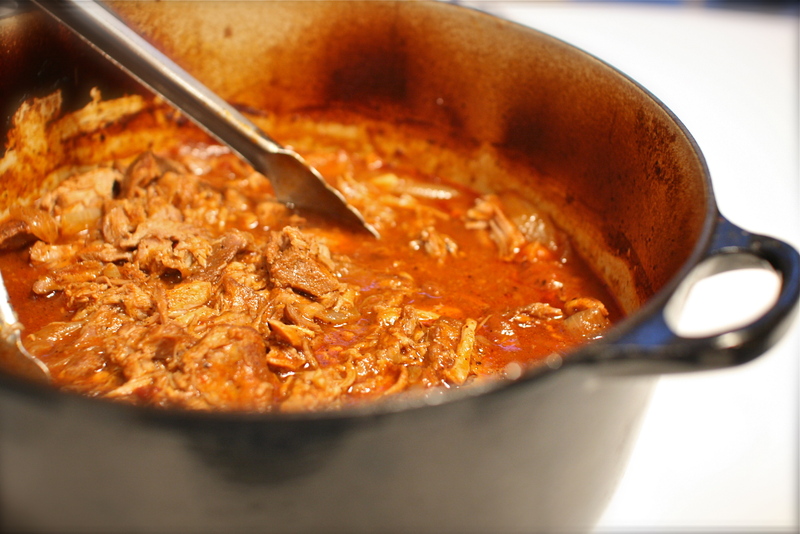 After the pork is done, remove the pot from the oven and take the meat out, placing it in a large bowl. Put the pot on the stove on medium-low heat. Simmer the sauce until it reduces slightly. While the sauce is cooking, using 2 forks, shred the pork. Add the pork back to the pot with the sauce and stir together so all the meat is coated. 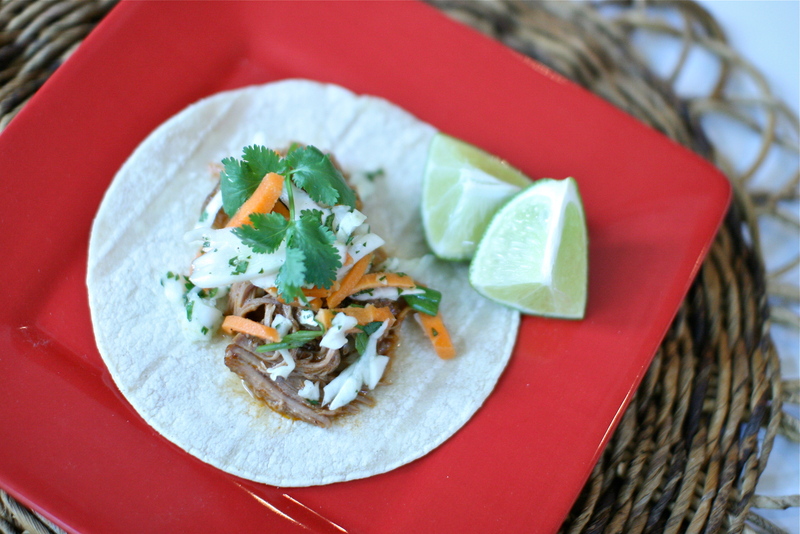 Serve with warm corn tortillas, cilantro slaw and a squeeze of fresh lime. Leftovers can be served on soft rolls as pulled pork sandwiches too. Tender pulled pork in 2hrs is a dream. Cooking the meat in large pieces, rather than a whole roast, really quickens the roasting time. I know that true BBQ enthusiasts would poo-poo this recipe, but the reality is most of us don’t have the time to slow roast anything for the hours they suggest. This is a very respectable cheat. Combine the vinegar, lime juice, canola oil and sugar in a bowl and whisk together. Place the remaining ingredients in a large bowl and pour over the dressing. Season with salt and pepper to taste. 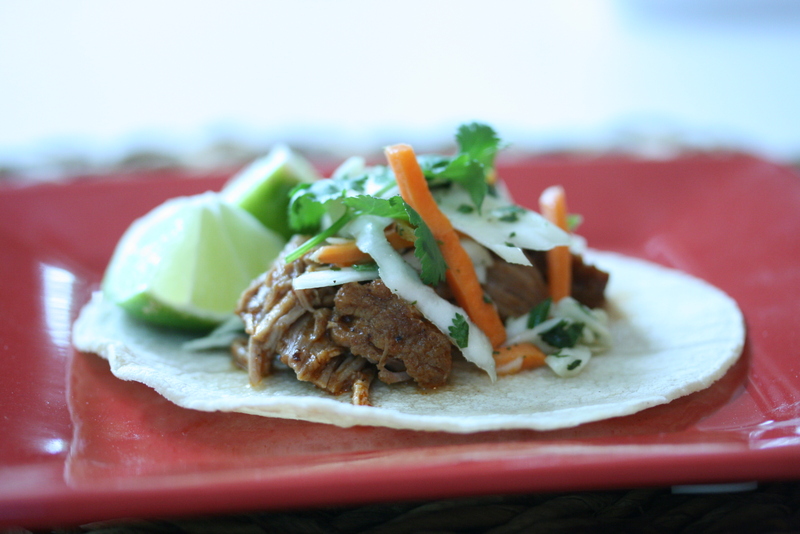 Serve with the pulled pork tacos. I think this is best when you let it sit for a while before serving. Make it when the pork goes into the oven and then place it in the refrigerator until it’s time to serve.